Whenever someone questions something that doesn't seem right on the national scene, and democrats immediately call those who question, "Conspiracy Nuts," it is fairly certain that the question begs further examination. And it is indeed proper to question something that makes absolutely no sense. The sudden death of Supreme Court Justice Antonin Scalia, and the circumstances surrounding it, has rightfully caused much speculation. First of all, it is not often that those who die a natural death do so with a pillow on their face. Plus the bed was perfectly made instead of being rumpled, which is usually the case when someone has slept on it all night. Nobody could be that neat of a sleeper. Obviously Justice Scalia had no feeling or thought of an impending medical emergency when he left for a stay at the Cibolo Creek Ranch in West Texas. Otherwise he would not have gone, period. It doesn't take a genius to figure that out. John Poindexter, who owns the ranch Scalia was staying at, said that: "We discovered the judge in bed, a pillow over his head. His bedclothes were unwrinkled," he told the San Antonio express-News. He had discovered the body later in the day. As prominent as his guest was, wouldn't Poindexter have checked on Judge Scalia when he missed breakfast? According to AOL News, a former U.S. Army intelligence officer who had top secret clearance, suspects foul play in the death of Justice Scalia. Ray Starmann stated: "The circumstances surrounding Justice Scalia's death are growing more suspicious by the minute." He pointed to the fact that the story appears to keep changing, with initial reports that Scalia had died of a heart attack and later denied. Starmann also questioned why no autopsy was performed and why Scalia's body was quickly embalmed, erasing any chances for the coroner to conduct efficient toxicology tests. This same question was posed by William O. Ritchie, former head of criminal investigations for D.C. police who also was "stunned that no autopsy was ordered for Justice Scalia." Richie went on to say, "How can the Marshal say, without a thorough post mortem, that he was not injected with an illegal substance that would stimulate a heart attack? Did the U.S. Marshal check for pretechial hemorrhage in his eyes or under his lips that would have suggested suffocation?" Would there be a motive if this was a murder? Ray Sternmann may have provided one: "Scalia was the tie-breaking judge, the man who could push back any liberal policies being shoved through the court. With Justice Scalia's death, the Obama Administration or a future Hillary Clinton Administration has a green door to confiscate guns, flood the country with illegals and wreck the Constitution," he writes. And one more to be added: If Obama succeeds in using his "Executive Order" to halt the coming election to proclaim himself "President for Life," you can bet that the loudest voice that would have been heard would be that of Supreme Court Justice Antonin Scalia. With him gone, Obama has a clear path for his agenda and nothing can stop him. 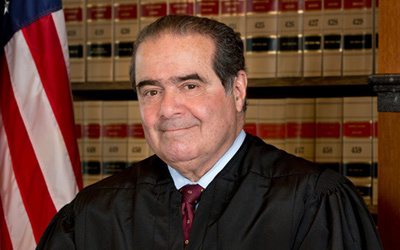 BREAKING UPDATE 2/17/16--We have just learned that Obama will NOT attend Justice Scalia's funeral this Saturday.